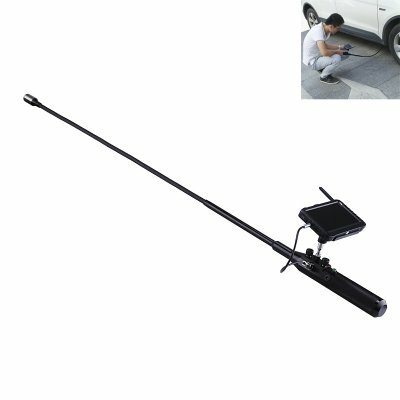 Successfully Added Under Vehicle Camera - 720p, Stainless Steel, Flexible Pipe, 120-Degree Angle, 12 LED Lights, IP68 Waterproof, 5-Inch Display to your Shopping Cart. This stainless steel under vehicle camera allows security personnel to check underneath cars, trucks, and trailers with great ease. This security gadget features a total length of 1.16 meters and is extremely slim. The shaft is flexible and comes with an intergraded HD camera at the end. This allows you to easily move your gadget around and enter tight space where the normal eye can’t reach. Coming with 12 bright LED lights, it even lets you check on the most hidden spaces underneath a vehicle. Simply attach it to the included 5-Inch display, and you’ll be able to enjoy a live view of all that your camera is recording underneath the vehicle. The under vehicle camera is easy to use and operate. It is guaranteed to save plenty of time and effort during upcoming security checks. Your security gadget furthermore features a waterproof IP68 design, meaning that you can use it in any weather condition and environment. With its 120-degree lens, the camera is guaranteed to snap clear images of all that lies around – ensuring that nothing stays hidden. Thanks to a powerful 200mAh battery, you’ll be able to use your gizmo throughout a full working day without needing to recharge. Along with your under vehicle camera comes a durable aluminum suitcase that allows you to easily transport your gizmo. This suitcase is extremely tough and prevents your camera from getting damaged by impacts or shocks. The camera itself is lightweight and compact, making it easy to carry along and operate for anybody out there. With this security gadget at your side, you can be guaranteed that not a single hidden item will ever pass by again. In order to store evidence, your car security camera comes with a 32GB TF card slot in which it lets you safe previous recording video and snapped pictures. This under vehicle camera comes with a 12 months warranty, brought to you by the leader in electronic devices as well as wholesale security gadgets..